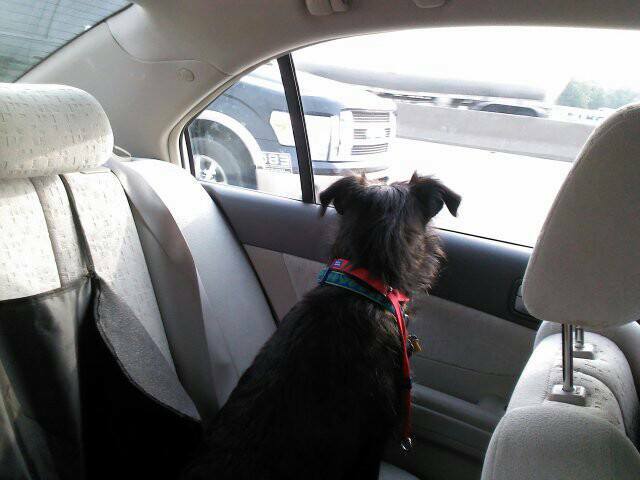 A few times a year, we try to take 4-day weekend roadtrips to get out of town. Let me begin by telling you that the only thing I enjoy more than roadtripping with my family, is sitting at home with my family. My husband and my son are both excellent travelers, and you couldn’t ask for better travel companions. This trip, we added in Hoo, and he was surprisingly good–save for his having minor meltdowns when it started to rain, and when he saw cows for the first time ever. He lost his mind over the cows. 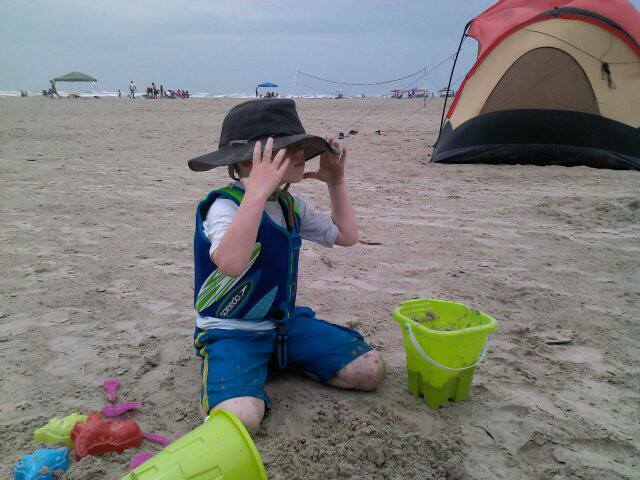 We usually get down to Corpus Christi at least once a year, and spend a day in Port Aransas, on Mustang Island, where the beaches are nicer. This year, we decided to skip to the chase, and just stay in Port A. Following are reviews of some of the products I bought specifically to take on our trip, and of some of the places we visited while we were there. Since we were traveling with Hoo, we knew we needed a good kennel for him. He has totally outgrown the one that came home with him, which seemed massive at the time. Since he’s clocking in over 40lbs now–help me–I went with the Dosckocil Pet Taxi, sized 36W x 25L x 27H. This is made for pets between 30–70lbs. It was great! Perfect for him. We put it in the trunk unassembled, and just put our suitcases in it. It traveled well, was simple to assemble when the time came, and there was plenty of room for Hoo to stand up and move around when it was time for him to go into Puppy Jail in the condo. 5 out of 5 stars. This blueberry muffin dry shampoo was perfect for our Hooberry muffin. I was worried about that wet dog smell, and that wet dogfish smell that Hoo might bring home from the beach, so I made an impulse buy of Pet Head Dry Clean, blueberry muffin waterless spray shampoo. You can spray it on wet, damp, or dry fur, then towel it off, or brush it in. This was another amazing purchase because Hoo never smelled better! When we would leave the beach, I would hose him down to get the saltwater off, then give him a towel rub, spray him down with the Pet Head, and give him a quick brushing. He never stank. In fact, he smelled quite nice. The bottle was easy to manage with one hand, and Hoo didn’t seem to mind it. 5 out of 5 stars. We planned to spend as much time as possible at the beach, and unless we were going to get a vat of sunblock to dunk ourselves in every 15 minutes, we were going to need some shelter. Also, I thought Hoo might need a place to rest between barking at seagulls. I spent a couple of weeks trying to decide between the Coleman Beach Shade and another shade without a floor. The deciding factor was that the Coleman Beach Shade could be zipped up to make a changing cabana. For about five minutes, when I was taking the thing down, I wished I’d gotten the floorless model, but outside of those few, sandy seconds, this was perfect! I was able to put it up by myself (with the help of our next tent neighbor’s loaned hammer) on an extremely windy day (the trick is filling up the included sandbags first, and using those to hold the thing down, or getting a 7 year old to put his foot in a strategic spot), and it came down just as easily. I even got it back into the tiny bag that it came in! We fit 2 beach chairs, a 27 can cooler, a dog, and other beach stuff in comfortably, and when we got hit by a sudden storm, the three humans and the dog just zipped up inside until it had passed. I wouldn’t have wanted to spend a night in such a small space, but it worked out really nicely for what we needed. Oh, and none of us got sunburned, so mission accomplished. I kind of can’t wait to take it out again. 5 out of 5 stars. Those 2 beach chairs were also an impulse buy. I was shopping for the cooler and Target had the chairs on sale for $10 each, so I bought them. These worked out well because of the high back. We could actually sit and relax, and there was room enough for Thor to sit on my lap through the storm. While in Port A, we ate at a few different places worth note. My absolute favorite was Seafood and Spaghetti Works. The name of the restaurant pretty much sums up the menu. B had shrimp tacos, and I had spaghetti, Thor had a kiddie pizza, and Hoo got my meatballs. We were all very happy. 5 out of 5 stars. We ordered in from Port A Pizzaria on Saturday night because Thor had gotten a little too much heat during the day. We had pizza, calzone, and fried ravioli. It was all fairly good. Nothing special, but nothing bad. 3 out of 5 stars. We also ate at Castaway’s Seafood Grill and Beaches Cafe & Bakery which were 3.5 and 2.5 out of 5 stars, respectively. 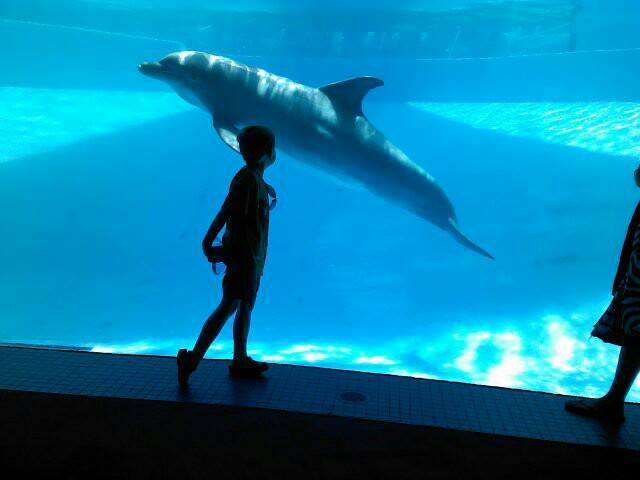 Thor and a dolphin friend. Thor had a good time at the aquarium. I don’t think it is a patch on the Dallas World Aquarium, but you can’t argue with its view of the Bay. 3.5 out of 5 stars. 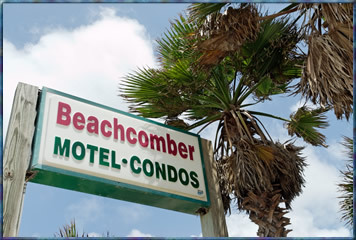 We wanted to stay as close to the beach as possible, and the best price we found was for a condo/motel combination called The Beachcomber. I am putting a picture of the sign here so that you can see it, remember it, and then avoid it. Now, I’m not high maintenance when it comes to lodging. I do love luxury, but I also have a deep, abiding fondness for dives. I don’t expect a lot from a beach condo in the first place. When I stay at the beach, I don’t want to worry that I am tracking in too much sand, or that I sat down on furniture in a wet swimsuit. I just want relatively clean, with a decent bed, and a door that locks. The best thing about the Beachcomber is its location. It took about five minutes to walk from the front door into the water. You can’t beat that. The worst thing was everything else. It smelled funny, the sheets were stained, the doors were broken–like pieces of the door were coming off–the carpet was outdoor carpet that looked like large rodents might have given birth on it, and it was impossible to close a door without lifting and slamming. On Sunday morning, the toilet quit working. We weren’t able to contact anyone to come fix it, so we used the shower in the best case, and drove to Whataburger in the worst. Like I said, I’m low maintenance on lodging, but I do require plumbing. 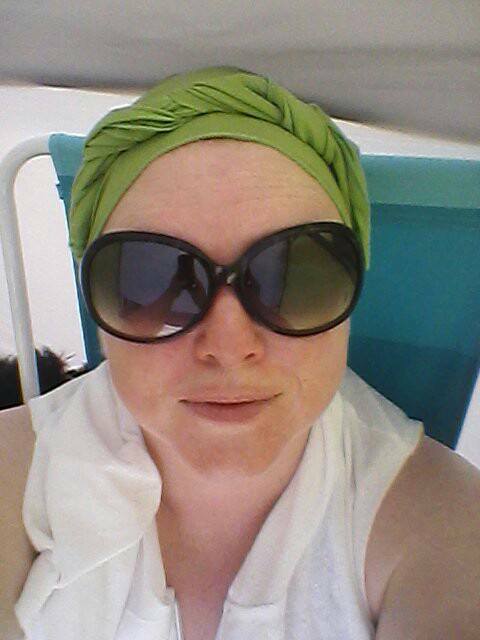 Otherwise, why wouldn’t I just go sleep on the beach in my tiny cabana? .5 out of 5 stars. Overall, it was a fantastic trip. I was with all my favorite boys, and we had a lot of laughs. Nothing is better than being with my family. Previous Post A Review: This is 40? It is Miserables.